A bleak, biting satire of patriarchy, The Handmaid’s Tale is an oddity within science-fiction. As dystopian feminist literature, the novel does away with the muscle-bound heroes of space opera, and dismisses the corporations of cyberpunk. Instead, Margaret Atwood invents an alternate future in which a religious police state, based on extremist Christian values, oppresses American women. The award-winning novel’s success allowed for adaptations for radio, cinema, opera, and stage. Set in the near future in the Republic of Gilead, the novel details the theocratic military dictatorship formed within what was known as the United States of America. After a staged terrorist attack (blamed on Islamic extremists), that wipes out most of the Congress and the President, a movement calling itself the “Sons of Jacob” launches a revolution and suspends the United States Constitution. They do this under the suspicious claim of restoring order. The Sons of Jacob run the Republic, using the Old Testament as reference for their laws. The women are reduced to being subservient to men, and are forbidden to read. They exist mainly to provide babies. The protagonist is a woman known as Offred. Wearing a form-concealing dress with a veil (similar to the Islamic niqab), Offred tells her story in first-person perspective, giving us accounts of her daily life in Gilead, the bizarre rituals, and her past life before the military state assumed power. The Handmaid’s Tale follows the classic conventions of oppressive states from previous literature, including Brave New World and Nineteen-Eighty Four. The idea of a Christian dictatorship in the United States is a fresh concept to science-fiction. Atwood believes that The Handmaid’s Tale is more a piece of speculative fiction, since the events in the book are very plausible. 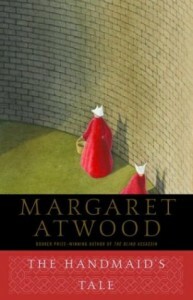 The novel runs the gauntlet of various themes and ideas including, nostalgia (Offred’s longing for the past), racism (the apartheid conditions for black people), desire (Offred’s lust for a man later in the story), eugenics (the implied shredding of deformed babies), and courage (Offred’s decision to join the rebellion, thus risking her life in the process). Pros: The inventive dystopia of the novel, through Christian politics, is a breath of air for this sub-genre. The characters’ motivations, shortcomings, and desperation are fun to read through and contribute to a deeper understanding of the scenario. June’s recollection of her past life is tensely woven by Atwood and adds more to the dreariness of the book. Cons: If there’s one major defect in the novel then it’s the ending. Without spoiling the outcome, the final reveal may come across as farfetched and unsatisfactory, in comparison to all that has occurred beforehand.